This article is part of a year-long feature - watching and blogging about twenty acclaimed, cult, challenging and rare films over the course of 2013. The full list of films (and links to other completed posts) can be found here. 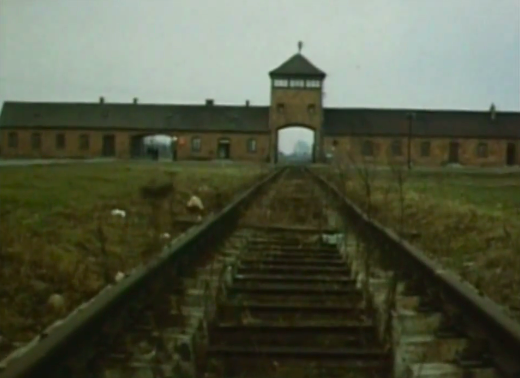 A penultimate nineteen: Claude Lanzmann's landmark documentary Shoah. I was going to leave Shoah until last. It's sheer size and reputation initially made it seem like a particularly appropriate punctuation mark to this mini-project, especially since the other 'long' film Satantango served as the opening salvo. But after watching Come & See, the little I knew about Shoah suddenly made it seem like a natural point of contrast and comparison with some of the observations I had there. They both attempt to represent World War II atrocities through the language of cinema - but, my word, the approaches are pretty much the polar opposite of each other. The experience, the sheer overwhelming force of viewing Shoah is near impossible to describe - appropriate, given the subject matter explored is one of the most shocking and incomprehensible chapters in human history. Its 550 minute running time (longer in some territories) is dominating, but the insights and depths hidden within make it worthy of the time investment. Rarely has a documentary so rigidly adhered to the director's stylistic choices. There is no archive footage. There's no explanatory voiceover - although many scenes do have voices over them, albeit not of the omnipotent narrator sort. There's not even any music, bar a handful of diegetic moments (some of the most evocative in the whole film, it must be said). Lanzmann instead believes in the power of the viewer's imagination, the film instead consisting almost entirely of talking head interviews and contemporary (well, early 1980s) footage of several locations of areas where the Nazi's mass extermination of Jewish people took place - Auschwitz and Treblinka, most prominently. The results are startling, the finished film almost conclusively proving Lanzmann's thesis on documentary construction, at least in relation to this subject. Taking in a wide range of voices - eye witnesses, survivors, perpetrators and an historian, among a few others - the film delves into the terrifying processes developed into the systematic genocide that was the Holocaust. From the early days when Nazi officers used jerry-rigged trucks as improvised killing machines, to the later years when the machines grew more specific and 'efficient' (what a horrible word to use in these circumstances) it's an at times uncomfortably detailed exploration of the reality of a deplorable era. Lanzmann gives space to voices discussing everything from the train controllers & drivers to the often futile resistance efforts that arose in concentration camps. In detailing in minute the systems and techniques developed in the 1940s for the 'final solution', Shoah's matter-of-fact approach manages to be much more disturbing than any red dress jutting out of a sea of monochrome. Some of the testimonies are shocking, some rile the blood (such as the elusive responses of former Nazis, or the barely disguised apathy and indifference of the citizens of towns and villages near the camp), almost all deeply moving or affecting in some way. There are moments among the most devastating in all of cinema, documentary or otherwise. One survivor, a barber named Abraham Bomba, presents his testimony with a stony-faced resolve, until one particular line of inquiry causes him to breakdown and struggle to regain his composure. Another (Jan Karski) hasn't even been asked the first question before he needs to leave the room, the emotional impact of his dreadful memories of the Warsaw ghetto saying as much as the memories themselves. The interviews form the backbone of the film, individual ones frequently being granted a half hour or more of uninterrupted screentime, particularly in the more solemnly paced 'Second Era' (the film being broadly divided into two halves). But there's more to Shoah than just talking heads. Of particular note are the tracking cameras that trace their way around the remains (literally and figuratively) of the concentration camps, evoking a spectral atmosphere that's equal parts disturbing and poetic. Abandoned railway lines are the film's most common visual motif, visualising the frequent remembrances of Jewish people being transported en masse via train. In another powerful directorial decision, the aforementioned barber recounts being forced to cut people's hair before they were sent into the gas chamber - an account made more provocative by the fact that Lanzmann chooses to have Bomba casually cutting a customer's hair. Accompanying the interviews, such sequences allow Shoah to become a film where history does not come 'alive' in the traditional sense, but certainly reaches deep within both the viewers' and interviewees' souls in a way more traditional documentary techniques could not possibly manage. It's impossible to fully comprehend the scale of the Shoah through a single film alone, and Lanzmann makes no claims of his film being definitive (indeed, he's even revisited the subject as recently as this year's The Last of the Unjust). But no film has ever communicated the horror, the scale and the specifics of the Holocaust in such an unforgettable way. I can't add much more to the discourse surrounding Shoah, and honestly I probably shouldn't have to. Despite the fact there are many pieces of excellent writing on this remarkable cinematic achievement, Shoah is a film so bold, so distinctive, so powerful, that it speaks for itself. Clear a day: this is a film that needs your complete attention.